Our Five Ring Circus: Not Me Monday! Welcome to another edition of Not Me Monday. It's time for my weekly therapy session. It's hard to believe that it's already March! Visit MckMama's blog for more Not Me Monday fun! I did not skip the last Not Me Monday because I had such a bad cold that I couldn't think clearly. It wasn't me who almost fainted when I saw a bead of Lexie's blood when the lab tech took the needle out of her arm. That would make me a bigger baby than my 2 year old. Oy. My 2 year old. I do not have a 2 year old. She did not turn 2 this week. She is most definitely still a baby! Speaking of the blood work, Lexie did not get chased around the office by her brother, and then vomit all over the floor, after a coughing fit. I did not try to catch said vomit in my hands. Ewww. Grant and I did not get to go out on a kid-free dinner date on Saturday. I did not put my husband to shame by eating way more than he did. I have not skipped my workout on the treadmill for the past 2 weeks. I am not convincing myself that the vomiting from my stomach virus, and then the constant coughing from my cold, were a better workout than the treadmill would have been. My pants are not way looser than they have been in a while! My parked car, that has been in perfect condition for FOUR years, did not get hit this week. I am not still angry over that. We did not spend a ridiculous amount of money on a fully furnished dollhouse for Lexie's birthday. It was not one of the best toys we've ever bought for her! Last, but not least...this is NOT a 2 year old girl. It can't be, because just yesterday, she looked like this. 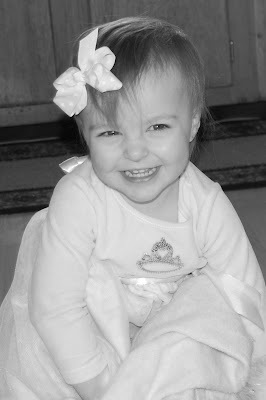 I am not madly, head over heels, crazy in love with my little princess and beyond blessed to have her in my life. Oh, wait, that part is most definitely true! But the other stuff? Didn't happen! Wow! She was such a beautiful baby and now even a more beautiful "big girl." Time flies way to quickly, doesn't it? My youngest turned two in January. Catching "said" vomit...funny how you don't even think twice about that, huh? Happy Monday! Hope you r feeling better. She is beautiful! And most certainly still a baby. After all, my 2 1/1 year old is a baby as well. A 38 pound baby, but still! So, did you catch the vomit? Great post... it's hard to see our little ones hurt. Isn't it amazing how incredibly fast they go from itty bitty to walking talking toddler. She is a cutie!! Happy Birthday to the NOT 2 year old! :) It goes so fast! I can't believe mine is 3! :) I have been avoiding the workout too. Sickness and exercise just don't work for me! :) Glad you are feeling better! She is so beautiful. Why do they do that to us and grow up so fast? By the way, the stomach flu diet totally counts as a workout. Awwww, your little princess is darling. You will blink and she'll be NINE like my little princess. Catching the vomit in your hands - Ahhh, the things we mommies do! Once again - I am NOT having full conversations via COMMENT BOXES. I never do such things. I failed miserably at catching the vomit, and ended up on my hands and knees, scrubbing the waiting room floor. What a cutie! My oldest will be 2 next Monday. Why do they grow up SO fast!?! How great that you had an evening out with your hubby! Have a great week! UGH! Still on the virus thing. Yuck! Hope you guys start feeling better soon. But, we are right being sick is sometimes the best exercise, too bad it doesn't feel better. Lexie is beautiful. That's a bummer about your car. I baby mine and I know the feeling about your perfectly good car being hit :-( Hope it gets repaired to your satisfaction. Oh, they just grow up too fast, don't they?!! !